Allows you to quickly and easily clean heavily contaminated wheels! The Sonax Wheel Cleaner Plus will help you rapidly break up just about any contamination that your wheels can come in contact with! It is non corrosive and pH neutral so you can use it on any wheel surface such as chrome, alloy, clear coated, polished, anodized, stainless steel, etc. Spray the clear formula on your wheels and watch it quickly break down contaminants, while changing to a deep red color. This color change lets you know the formula has broken down, softened and loosened the contamination, allowing you to easily rinse your wheels clean. It's especially good at removing iron deposits often left on the wheel finish that is often challenging for other wheel cleaners to remove. Wheel Cleaner Plus is formulated 30% stronger than the popular Sonax Wheel Cleaner Full Effect, which allows you to clean your dirty wheels from brake dust and contamination at a much faster rate. 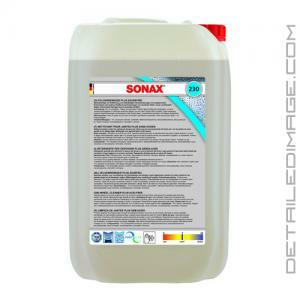 If you are looking for a high quality, safe and easy to use wheel cleaner, pick up the Sonax Wheel Cleaner Plus! I am mainly happy with the fact that it can remove a lot of buildup on wheels without any agitation, meaning one can simply spray it on all the wheels, leave it for a few minutes and rinse it while rinsing parts of the car during a wash, while still getting great results. A quick wipedown with a microfiber towel after will ensure a completely clean wheel. For all steel, alloy, chrome and polished wheels. Removes even the most stubborn dirt and brake dust. Non-corrosive. Fast acting and powerful acid-free wheel cleaner. Easily and gently removes stubborn dirt such as baked on brake dust, although the product is very gentle on the surface. The acid-free formula is safe for use on clear coats and will not corrode wheel bolts. With citrus fragrance. Shake before use. Best when applied to COOL, DRY wheels. Turn nozzle to the spray position. Evenly spray the wheels from a short distance. Allow the cleaner to work for 2-4 minutes. On contact with the wheel, the product begins to change color to a deep red, revealing its full cleaning power. If necessary, a soft brush or the SONAX Wheel Rim Brush can be used to manually aid with deep cleaning. To finish, rinse the wheel, tire and brake system thoroughly with a strong water jet or high-pressure water. One of the best wheel cleaners money can, it's effortless to use, wish they could come up with a bigger spray bottle for a reasonable price. I've always used (and recommended) P21S wheel gel. I tried this and it seems to work a little better for stubborn black dust. The only downside is the smell- worse than week old gym socks. I appreciate the wholesale account/pricing and great shipping from you guys, definitely my favorite place to order from! !